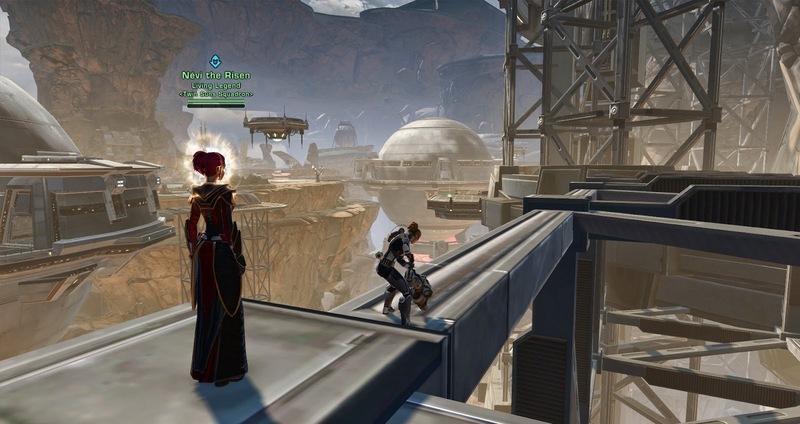 I've written about my changing relationship with datacrons before. At launch and for the first couple of months thereafter I didn't care about them at all. When I built my first matrix cubes, I looked up which shards I needed and how to get them and that was it. It was only later, when I levelled alts with other people who liked picking up datacrons while levelling (most importantly my pet tank), that I was more or less forced to learn where most of them were located - and eventually it just seemed natural to pick them up on my own as well whenever I had the chance on a new alt. As a result, most of my characters have most of the datacrons these days, barring some toons that were created a long time ago (before my change of heart) and for whom I couldn't be bothered to backtrack to get the missing datacrons yet. There was one exception that I didn't have on any character however: the Makeb datacrons. Many months ago, my pet tank and I set aside an afternoon to get the endurance datacron on Makeb, and I don't remember how many hours we actually spent on trying to get it, but let's just say that we lost the will to live long before we actually achieved anything. To this day I remain impressed by how whoever's responsible for this particular piece of design could ever think that the way this datacron is set up was a good idea. I don't mind difficult jumps (even though I'm not good at them), and I don't even mind falling to my death every time I fail - provided that I can pick myself back up and try again with ease. What I do mind is being challenged by several difficult and deadly jumps that also require you to spend ten minutes running back to get back to where you were after every attempt. The worst thing for me was that I would find myself actively regressing after a certain number of failed jumps. As I grew increasingly impatient during the long runs back (thinking, "I know how this bit works, I just want to get back to the tough part") I would mess up earlier and earlier until I couldn't even come close to matching my previous progress anymore. It was just an exercise in frustration. Pet Tank and I pretty much vowed to ourselves that we weren't going to ever bother trying again, and then never even looked at the presence datacron either, even though that one is laughably easy in comparison. Until... last night, when a guildie spoke up after a social ops run, saying that he was going to go for the Makeb endurance datacron and invited us along with the intent turn it into a fun guild event where the more skilled could help out the jumping-impaired with pulls and the like. I wasn't thrilled, especially since it was late, but I also realised that multiple people actually offering to help me was a rare opportunity, boosting my chances of actually making it to the datacron to the highest they were ever going to get. So we set out as a group of seven to start that long journey of jumps. We got split up pretty much immediately, with one or two people impatiently racing ahead as they already knew what to do while others lagged behind, unsure of where to go and afraid of falling to their deaths. I felt my frustration levels rise again almost right away, as I kept failing at the simplest of jumps even though I knew that I had been able to pull them off before. There was at least one occasion where I considered bowing out of the whole event as I was worried about getting too frustrated. But others died too, and the guildie who had initiated the whole thing as well as my Sage healing buddy from ops were remarkably patient when it came to running back to help us failures catch up again or assist with getting across a particularly tricky gap. And then, at last, the endurance datacron was in my sights and with no more difficult jumps left in the space between us. I could hardly believe it. 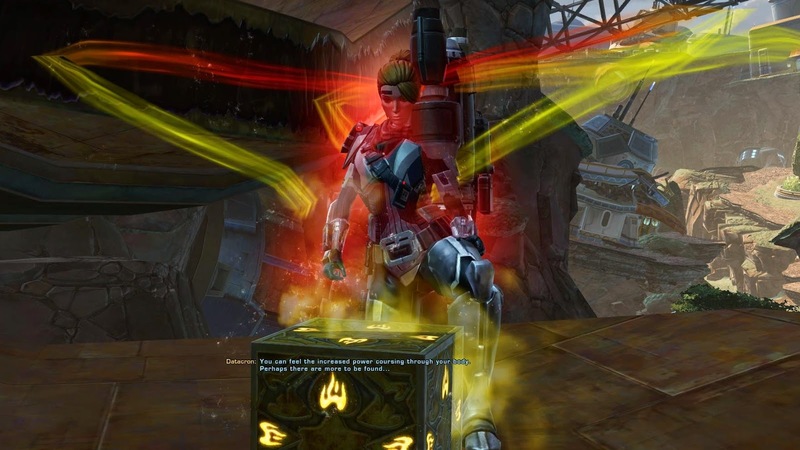 A guildie that got it at the same time had the Galactic Datacron Master achievement pop up for him, and I was told that I should be able to get the presence datacron that evening as well, since it was actually much easier to get. It was, and it didn't take long at all, so I got my achievement too. The Makeb endurance one gets easier the more times you do it. I found a few jumps where using my speeder made it easier for me than what was suggested in some of the video guides. I wouldn't have expected a med centre res in the middle, I just think they shouldn't have placed it quite so far out in the first place. They could have required a similar number of jumps without making you cross over from a completely different mesa. Most are visible, it just that we need to stop and look around at the game world in all dimensions from time to time. It's too easy to have the 'quest blinders' on and not appreciate the details of the environment. I do agree you need to check the web for some of the datacrons. The Republic strength datacron is annoying that way -- on several levels -- to find since is hidden in its own little area. I don't know, I'm more inclined to agree with Telwyn here. I quite like to explore usually and levelled several characters to max level before I'd found all the datacrons. But even then, I think I managed to find less than a third of them "naturally" because they usually required running halfway across the map on top of a long row of pipes or something. congratulations on getting the Makeb Datacrons. I agree once you get it on one character, its easier to get it on others characters.